New Year’s Day, a time for reflection and resolutions, and I found myself drawn to the Peace River in Arcadia. Paddling the Peace seemed appropriate and reinforced a resolution I had already made to myself, to stay in the moment and to seek joy in living. The Peace River is a blackwater, coastal river which originates with waters from Lake Hancock in Polk County around Bartow, and after 76, 106, or 133 (I’ve read all three!) miles, it ends as it expels its water into the Charlotte Harbor estuary. At least two different stories explain how the Peace River got its name, but the one I hear most frequently is that the Spanish had named it Rio de la Paz, “river of peace,” way back in the 1500s (Huff). So, on New Year’s Day, the Canoe Outpost folks put me in at the Brownville landing around noon just as the sky clouded over and the breeze picked up. Paddling downstream into the wind felt more like paddling upstream until a bend in the river brought relief. Brownville is north of Arcadia, where my paddling excursion would end. The area is mainly agricultural and ranch lands, and at this time of year, everything was, indeed, brown. Although Katie at the Canoe Outpost told me it was a slow day on the river, I passed a number of kayakers and canoers. Some were simply enjoying the paddle while others were fishing or panning for fossils, shovel in one hand and strainer in the other. I’ve heard that many find treasures such as giant sharks’ teeth, mastodon teeth, and other prehistoric fossils. This river has so much history. In the 1700s, Seminoles settled along its banks, and several conflicts took place there (Boning). In the 1900s, barges traveled up and down the Peace to mine phosphate and harvest cypress logs (Huff). I saw a very large hole at the top of one of the banks when I made a stop at Oakhill (owned by Canoe Outpost). At first I thought this was a sink hole, but perhaps it was the remnants of a phosphate dig. Lacking the green lushness of most of my previous paddles, there was still a beauty in the various shades of brown along the white sandy banks (think “golden brown meringue”). The river was wide and varied ranging from high banks to low sandbars. 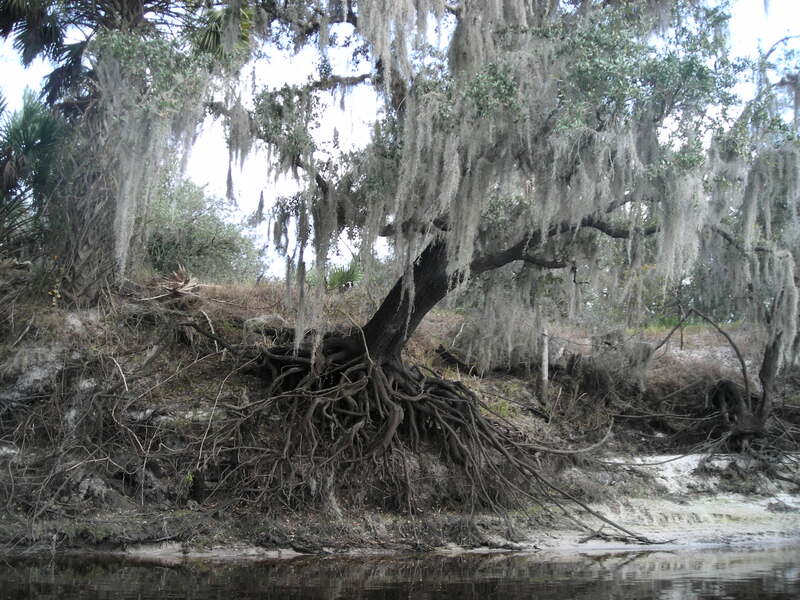 Live oaks draped in silver moss hung from the banks, their huge root systems twisting and reaching for something to stabilize them, the soil beneath them eroded away. The cypress had lost their foliage. Dead, fallen trees decorated the river like pieces of abstract art along a city street. The dark water was cool and slow moving except for occasional shoals and incoming streams. I saw turtles, herons, egrets, hawks, and vultures. Carter et al. gave the Peace River a “B,” although she gave another section—Zolfo Springs to Garner—an “A.” I would concur with the “B” on this segment (and as an instructor, I would add that it’s still a good grade!). Keep in mind that my paddle was only 10 miles and one segment of about 61 miles and nine segments that can be navigated. If you consider a paddle on the Peace, check out Huff’s guidebook and her descriptions of each of these segments. (Canoe Outpost-Peace River. 2816 NW County Rd. 661, Arcadia, Florida 34266. What a great discription…I appreciate how thoroughly you research your trips and include the history of the area as well. You describe your trips so well. I especially enjoy how thoroughly you research the details and history of the areas that you visit.